Free download Crossed Swords game for PC. It is slash & hack action type arcade game. Crossed Swords is very simple and light game developed by Alpha Denshi. 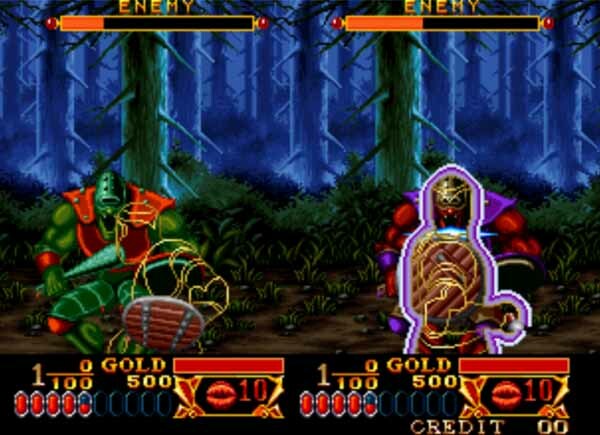 This game was developed by SNK for Neo Geo arcade system. The game will easily run and can be played on your PC/Laptop by following the instruction at the end of the post. Crossed Swords game starts with a coin by pressing the F3 button from the keyboard. You have to select the chapter 1 to start the game. A villager will ask you to help them and protect them from monsters. You will see your player on the screen with transparency effect. This effect was made, so that you could see your enemy to attack. Crossed fire is very easy to play. You can attack with your swords using the buttons as mention at the end of the post. There are two types of attacks that can be used using keyboard buttons. During the attack, using left right movement will increase the attack count and destroy the enemy very fast. Crossed Swords is very suitable for child however elders can also try this.